The St. Clair River was designated an Area of Concern in 1985 by the United States and Canadian governments due to poor management of pollution problems long before regulations better protected our river. Areas of Concern are waterways around the Great Lakes that have severe environmental degradation and are in need of restoration. 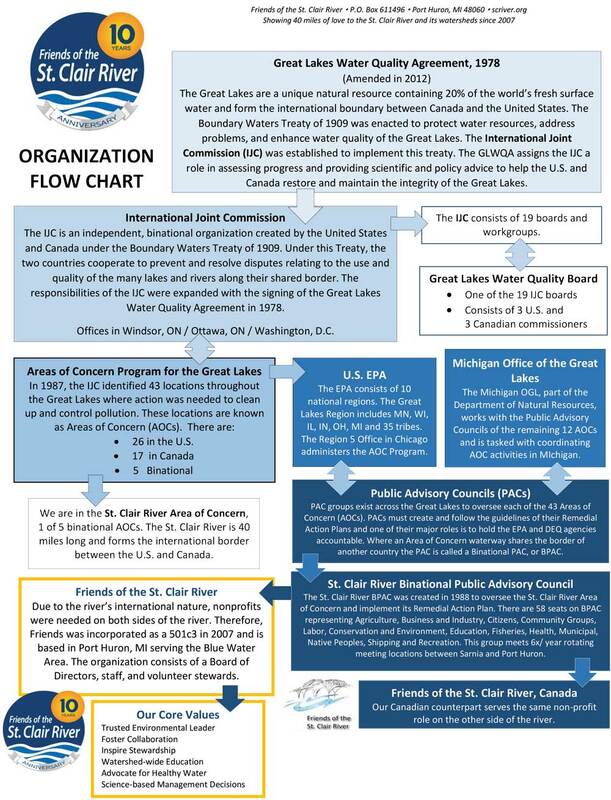 In response to this, partners on both sides of the River were required under the International Joint Commission to form the St. Clair River Binational Public Advisory Council (BPAC) to oversee a plan restoring the River’s health. Funding was needed to implement this plan. As a result, in the late 1990’s, Friends of the St. Clair River (Friends) was incorporated to serve as the non-profit arm supporting the American side of the River. A similar non-profit organization was developed on the Canadian side of the River. Friends filled the role as fiduciary to obtain grants supporting St. Clair River remediation projects. Thanks in part to these early efforts, substantial progress was made to the River’s health, including: contaminated sediment cleanup projects, reductions in industrial chemical spills, and a decrease in fish and wildlife tumors and deformities. However, in 2000, federal budget cuts in both countries slowed progress for the Great Lakes Area of Concern Program and in 2002, Friends of the St. Clair River dissolved as an organization. BPAC limped along with little support. A resurgence in volunteer energy following a 5-year absence resulted in the formation of a new non-profit; and in 2007, Friends of the St. Clair River Watershed was granted IRS tax-exempt status. A grant from the Community Foundation of St. Clair County provided the necessary start-up funding. With a new identity and Board of Directors in place, progress immediately began towards implementing education activities and formulating the structure for this re-launched watershed organization. After thirty years of collaborating on international river restoration efforts and execution of numerous watershed management plans, St. Clair County’s waterways, collectively known as the “Blue Water Area”, are increasingly healthy and offer many recreational, social, and environmental opportunities.